Ask fellow campers about "Park On The Lake" and nearby attractions. We drove thru this park to see if we wanted to stay. Dumpy, old rv's, small spaces. Not nearly as nice as pictures. No way Josea! We camped at Park On The Lake in a Travel Trailer. Got the PA rate for all 4 days we were here to visit family. But the place is a dump. Sandy, dusty conditions, lots of full timers. Pool was full of algae. Hot tub had green water but cleared up the next day. Didn't dare use either. Poor internet. Advertised that it had cable but it didn't work. A neighbor said it never worked. The kicker was the laundry. Did wash on the last day. The machines work on a pre-loaded money card. First you buy a card for $5 and get $3 in laundry credit. So the card costs $2. Then you have to load increments of $5 on the card. What a ripoff. Unless you just need a quick stopover, I would avoid this place. We camped at Park On The Lake in a Motorhome. Rate reflects monthly stay. Overall I would love to really, really like this park but a few things conspire to prevent that. First the good. 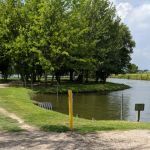 The park has a terrific location with beautiful views of Lake Conroe and immediate water access right behind your RV. The pool and hot tub are clean but we did not get a chance to use them. The office staff appear nice enough but not overly so. In fact, if you stay a while you will learn how little they respect their customers. There is a beautiful little "island" (really a peninsula, but they call it an island) at the back of the park with great opportunities for fishing. A fenced dog walk area and child playground are in place and appear to be well maintained. That's the good parts. The bad starts with the pot hole infested entrance that resemble roads you would find in the oil patch. The Wi-Fi works, but is easily overwhelmed and rarely has enough bandwidth to work at all. The restroom are "cleaned" daily but not very well and are very out dated. Spider webs and insects occupy every one other than the one in the office. The cleaning lady is rude. The office lady and cleaning lady went on and on about how rude their tenants are, then began gossiping about various tenants. Again, this was an overheard conversation. Someone should tell them that this behavior is extremely unprofessional. Prepare to have to wash your RV after staying here as the dirt roads will have them dust covered after a few days. which begs the eternal question, "Why, of why don't RV park owners get a clue and PAVE THEIR ROADS??" All in all, I would say we will not likely be back to this park. There are much nicer parks in the area. While a beautiful concept, this under managed park just doesn't live up to it's promise. We camped at Park On The Lake in a Motorhome. We are Passport America members and rates reflect that. This park has very generous rules regarding PA stays. Sites are a little close together, gravel sites with grass, no slabs. Picnic table at each site. Overall, a nice park with extremely nice and helpful employees. Effort is made to minimize potholes and maintain dirt/gravel roads. Pool looked great but it was too cool to use. Spa is just sectioned from pool so water is not warm/hot. Wi-Fi worked well at our site during both of our visits. Many long-term residents, some of whose sites are dirty and/or unkempt though not to extreme we have seen on some of our travels. We camped at Park On The Lake in a Fifth Wheel. Beautiful campground. The managers and owner are doing a lot to clean up the park. The sites on the water are fantastic. We set outside the RV fishing. My son caught his first fish here. The staff was super nice and there was lots to do. We were here during their Halloween party that had some of the best fried catfish I have ever had. We will definitely stay here again. We camped at Park On The Lake in a Fifth Wheel. Disappointed after seeing website. Sites are small. Mostly permanent residents with cluttered sites. Camp bathrooms have no paper products or light bulbs.They should board them shut if they aren't going to clean them and make them of use. 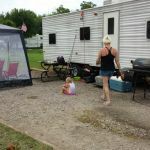 Seems more like a trailer park than campground as campers don't go walking and visiting like in most campgrounds. We camped at Park On The Lake in a Motorhome. Super location on Lake Conroe, the staff was outstanding and the park is very clean. We had a little pier right behind our RV. We caught seven nice size catfish, had a fish fry and a very relaxing 3 days. 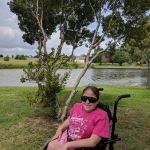 This was our third trip to Park on the Lake and loved every second of it We camped at Park On The Lake in a Motorhome. It appears as if most of the guests were semi-permanent so most of the sites were cluttered. The sites were small, crowded, and I would not stay here again. We camped at Park On The Lake in a Motorhome. Rates are based on Passport America. We have stayed at this campground twice. The first in a 5th wheel, and the last in a motor home. The staff are very pleasant, as is the owner. The campground is well maintained as is the dog run. The map on the web site "parkonthelake" shows piers along the canals. The canals lead out past the little island to Lake Conroe. Fishing is allowed anywhere along the banks and on the piers. There is a boat ramp for guests. The pull through sites are close together and do not have shade trees. The back-in sites do have shade trees, minus one that came down in front of our car during hurricane Ike, and a few others throughout the park. It is a very relaxing environment. We will stay here again. We camped at Park On The Lake in a Motorhome. This was our very first trip in our new RV. It was a very nice, relaxing weekend. This park has a clean swimming pool and a tent camping area. This is not exactly on the large part of Lake Conroe, but more like a little inlet. We backed in to our site and just a few feet behind out site, we were able to sit in the shade and fish. We didn't catch anything worth keeping but it was convenient and quiet. We camped at Park On The Lake in a Travel Trailer. Not what we expected. Older trailers and tight spaces. We camped at Park On The Lake in a Fifth Wheel. The park is not on the lake. There is a canal that leads from several of the campsites to the lake, but the lake is extremely low, and it's very difficult to get there. Besides, most of the premium spots on the water are taken by permanent and/or seasonal residents. Park could use more garbage dumpsters, as they were always full and not very conveniently located. We did find the hot tub and swimming pool clean and very inviting. The staff was also very friendly and helpful. We camped at Park On The Lake in a Fifth Wheel. Are you affiliated with Park On The Lake ?